COHEED AND CAMBRIA has signed a deal with Roadrunner Records. The band's brand new studio album is due later this year. The progressive unit comprised of Claudio Sanchez (vocals, guitar), Travis Stever (guitar), Josh Eppard (drums) and Zach Cooper (bass) made the announcement in a shadowy video clip shared today on Roadrunner's official YouTube channel. 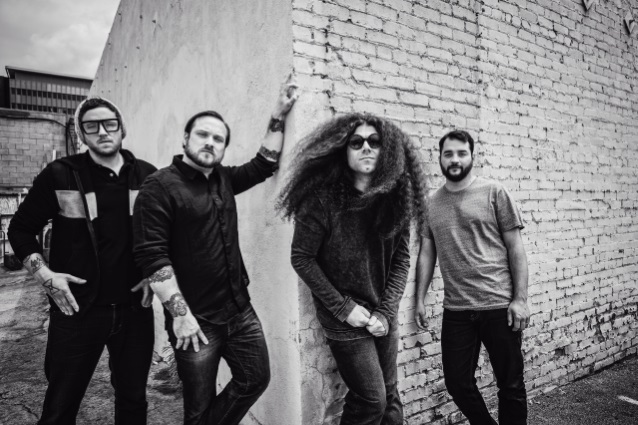 This summer COHEED AND CAMBRIA will set out on a U.S. co-headline tour with TAKING BACK SUNDAY and special guests THE STORY SO FAR. The 28-city trek, produced mostly by Live Nation, will begin on Friday, July 6 in Miami, Florida and make stops in Atlanta, Nashville, Boston, Philadelphia, Brooklyn, Chicago, Cleveland, Austin, Denver, Las Vegas and more. The summer tour will culminate in a performance at Comerica Theatre in Phoenix, Arizona on Sunday, August 12. It's been over two years since COHEED AND CAMBRIA's 2015 album, "The Color Before The Sun", was released as the band's first "non-concept" effort over the span of its 15-year career. The album left the sci-fi universe of "The Amory Wars" and instead focused on frontman Claudio Sanchez's personal life, including the birth of his first child. With 2018 upon us, and a major summer tour now announced, the volume of fans' chatter for a new album and whether or not it will return to the band's fictional concept arc will surely reach new heights. COHEED AND CAMBRIA is a rare band whose music is able to transcend "scenes" and effortlessly cross genres of rock — from indie to progressive, to metal and pop-punk to classic rock. The band is frequently compared to progressive, operatic rock bands of the '70s, ala QUEEN, SUPERTRAMP or RUSH due to their thrilling concept albums that take you on a grand journey of sounds and often clock in around 10 minutes, but still somehow include sugary pop-laden hooks. The group's following has grown steadily every album, partly due to their ferocious live show that brings fans to their knees with an equally expansive light show. This summer, the band will be performing songs from their expansive catalog, and we can only imagine they'll pull a few new tricks from up their sleeves.